JAI 24 – Can’t help myself! 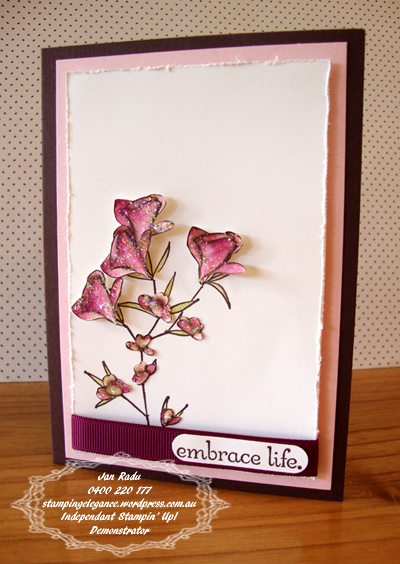 I couldn’t help myself but create a card with the Just Add Ink Sketch Challenge #24 this week. Isn’t this sketch great? Thanks for stopping by now run on over to JAI and check the other fab challenge entries! Another gorgeous card. You’re on a roll! That’s cute, Jan – love those colours. This is gorgeous Jan. I don’t think I’ve managed to catch up with you over at JAI yet – congratulations on the DT appointment, your work is stunning! This is just beautiful Jan! Beautiful, rich, colours, and I love your popped up, glittery flowers and distressed edges. Love it all, Jan! Gorgeous card!! Love it! Congrats on joining the JAI team! So excited for you!! Love the new blog design too – gorgeous!! beautiful card. The dimension you gave the flowers really makes the card a stand out!! This is BREATHTAKING!! I love it! WOW – aren’t we going to be in for a treat with you on the JAI- DT. Congratulations on being a JAI girl, this is a very beautiful card. This is gorgeous Jan. I saw it pop up of the slide show and thought ” oooooh….I likey” was not surprised when I saw whose it was! Great just for fun card! OMG!! Thats is absolutely BEAUTIFUL!!!!! Love the sparkly 3d flowers. Gorgeous! *sigh* How can I compete with you!!!! As soon as this popped up I gasped – so gorgeous. Wow, this is absolutely stunning Jan!